Recent studies have revealed that car owners are becoming more aware about the fuel efficiency of their automobile. People are now starting to realize the cost effectiveness of pure electric vehicles (EV). Having electric cars is an excellent long term solution to control expenses on the highly expensive gasoline. Though the EVs are slowly but surely gaining popularity, it is still yet to gain momentum because of the higher price and lack of battery recharging stations. In many places, the local governments have waived off congestion tax and making these cars more lucrative purchase for the car owners. The best part is that owning an electric car though costly at first, will prove to be quite economical in the long run. The Mitsubishi i-MiEV and Peugeot iON are the new electric cars which are about to be launched soon. It would be quite interesting to know, how much it would cost to have a pure EV versus a conventional car with an internal combustion engine. It would be wise to analyze it as per kilowatt-hour, the maintenance cost and running expenses of the cars. Let us analyze the cost of gas, as the car runs at 30 MPH; the gas cost would be £1.84, the car will run on gas costing £6.1 per mile. If we see the efficiency of hybrid cars, these cars get energy from gasoline at an efficiency of 25%. Most of the energy is lost in auto dynamics, engine heating and resistance. If the car uses its full potential, the same car will run 140 miles on one gallon, rather than 30 miles. The battery of an electric car will charge and discharge by using the power grid functioning at the capacity of 90%. The performance of the cars which have rear engine depends on the size as it translates the electricity in energy, also using 90% capacity. Both Mitsubishi i-MiEV and Peugeot iON operate at over 80% of mechanical energy. Therefore, the performance of an electric car is three times more effective than gasoline powered cars. The total energy in a gallon of gas is 32.95 kilowatt-hours of energy and the usual cost is £6.1 which makes a trip of 100 miles worth just £2. Compared to gasoline powered cars, electric cars run on less energy and drive the same distance and the cost of the fuel is much less. This is the biggest advantage of green vehicles in general and electric car in particular. The running cost of an electric car is much economical when compared to petrol or diesel cars. It would not be wrong to say that you can actually run your electric car just by spending two pence per mile. 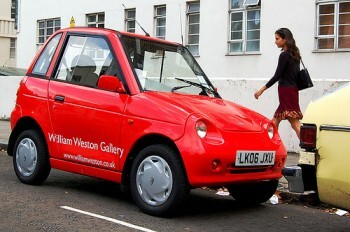 The road price of Mitsubishi i-MiEV is £24,045, in addition the grant which value around £5,000. The immediate competitor of the i-MiEV is the Nissan Leaf, which as per the statics is the market leader with the online price tag of £23,990. The manufacturers provide a personal contract buying structure, with an initial down payment of £3,850; you can own the vehicle with monthly installment of £397. The cost will come to total of £28,204, which is more by £4,214 as compared to hundred percent payments at the time of purchase. Nissan has more functions and additional facilities as compared to i-MiEV. Costing wise, owning a pure electric car is still on the high side compared with a conventional vehicle. But I’m sure with the economy of scale, the cost of EV will come down sooner or later.